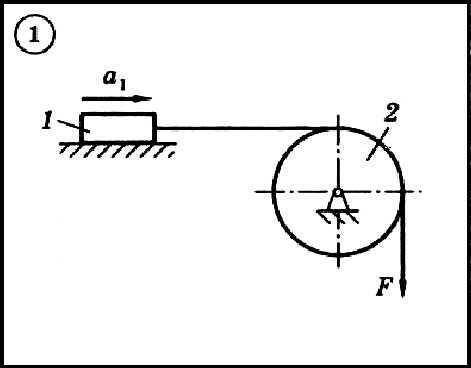 For the mechanical system shown in the diagram, using the d´Alembert principle, determine the force F necessary to move the load with a given acceleration a1, and also the force in the load cable. Initial data: the masses of the load m1 and the drum m2, the radius of the drum R2 (for the double drum there is also r2), its radius of inertia ρ2 (if not specified, the body is considered a homogeneous cylinder), the angle α and the friction coefficient f are given in the table. Numbered blocks and skating rinks are considered weightless. Friction on the axes of the drum and blocks is neglected.